Jeannie Long (83) of Choctaw, Oklahoma died January 21, 2019, at St. Anthony Hospital, surrounded by her family. Her Funeral will be 2:00 P.M., Thursday, January 24, 2019, at First Baptist Church, Nicoma Park, OK, under the direction of Dr. Mark Walters. She will be interred at Arlington Memory Gardens, Midwest City, OK.
She met her husband Aubrey F. Long through the choir at Trinity Baptist Church, in Oklahoma City. They were married at Trinity Baptist on February 24, 1956. She and Aubrey both worked hard during their life together and cherished the friends they made. 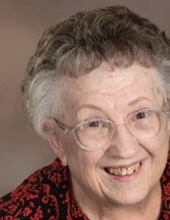 She was a faithful member of First Baptist Church of Nicoma Park, Oklahoma. Jeannie loved music and played piano and sang in the choir many years. Her family cherished the times they gathered around the piano and sang Christmas carols while she played the piano. Jeannie was always involved with church and promoting the Gospel to children through Sunday School, Girls in Action, and Children’s Choir. She made sure her children were always in church and always active in music and mission programs. Her children still carry her witness of Jesus Christ to the world. Jeannie’s last memories are of worshiping in her church with her daughter April and her great grand-daughter Ruby on Sunday, December 23. Her last minutes in the hospital were with the Bill Gaither song “He Touched Me” playing in her ear. Her final breath was while listening to the words “He touched me and made me whole”. She is survived by her children, Steve and Sandy Long of Plainview, TX, April and Michael Fillippini, Mark Long of Oklahoma City, OK, and David and Christine Long, of Choctaw, OK. She cherished her grandchildren Katie and Laban Lack of Cowden, OK, Kevin Long of Lubbock, TX, Sarah and Sam Nicholas of Midwest City, OK, Adriel Fillippini of Bellbrook, OH, and Uriel Fillippini and fiancé Annabelle Lichtwark of Wellington, New Zealand, Shelby Elliott and fiancé Shelby Scott of Edmond, OK. She also cherished the fun and interaction she had with her great-grand-children, Wyatt and Grace Lack of Cowden, OK, and Ruby and Jack Nicholas of Midwest City, OK.
Jeannie lies in state at Barnes and Friederich Funeral Home, 1820 South Douglas, Midwest City, OK. Barnes and Friederich Funeral Home are in charge of the services. To send flowers or a remembrance gift to the family of Jeannie Long, please visit our Tribute Store. "Email Address" would like to share the life celebration of Jeannie Long. Click on the "link" to go to share a favorite memory or leave a condolence message for the family.